So the holidays are finally here! (And we shall ignore the fact that I worked all day Friday and then went into work on Monday late morning and Tuesday all day…)- one thing that the holidays mean is more time for baking! I was sent some liquid whole egg from Two Chicks (I have bought their egg whites before) so I have been very busy indeed! Each carton contains 10 free range, pasteurised eggs, with no added preservatives. First up was a lemon cake, to take to work for someone’s leaving lunch. 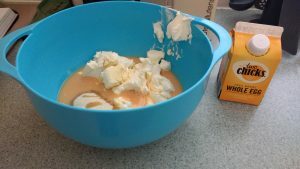 The cartons do make it easy as you can just pour the egg in to the batter (and they have amounts on the side to show how many ml= a small, medium or large egg)- normally I crack one egg, put the shell in the bin, rinse my hands, and then do the next one. This time I just had to pour i it into the bowl. Plus the yolk and white are mixed in- no beating required! 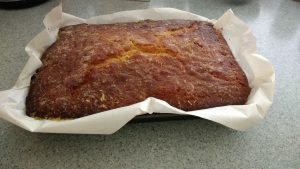 This lemon cake is one of my favourites- it is from the cookery book by Jo Wheatley (she won the Bake Off one year)- like many lemon cake recipes, after baking you cover it in a mixture of lemon juice and sugar, so the lemon soaks in and the sugar makes a crunchy topping. It was a very popular addition to the lunch (thanks to the great recipe). 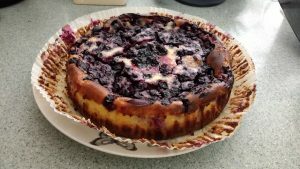 Last week our blackcurrant bush was rather heaving, so I decided that a blackcurrant cheesecake would be a good dessert to take over to Andy’s parent for our Sunday tea. 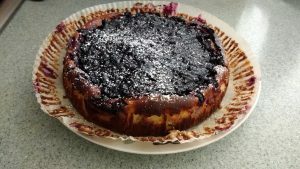 I found a recipe for a baked cheesecake (actually a blueberry one, in Rachel Allen’s Bake)- again the egg in the carton made it very easy to make a smooth batter, as it takes a while to mix the yolk and white together. The blackcurrants were baked into the cheesecake mixture, but I still had a lot left so I cooked them in a pan with a little sugar, to make a topping. It was a lovely summery dessert. On Monday morning I had a long run (13.1 miles, more on that another time) and when I got back I really fancied French toast. 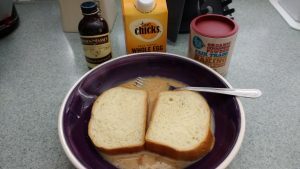 I was in a bit of a rush as I was heading into work, so I mixed some egg (I didn’t measure it, just put some in the bottom of the bowl) with vanilla and cinnamon, and put in two slices of brioche loaf. When I came down after my shower, the bread had soaked it all up. 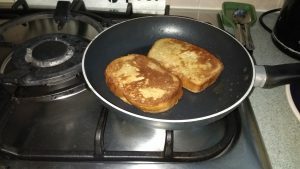 I honestly think this is the best French toast I have ever made! The batter was so even (can you detect a theme here?) and the slices cooked perfectly. I cooked some cherries in a pan to serve alongside, and had it topped with the last of my maple butter. 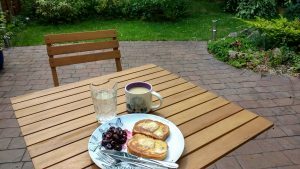 I enjoyed this breakfast in the garden (plus coconut water and tea)- perfect. I think the only drawback I have found is that if a recipe calls for the egg to be separated, you can’t use the liquid egg for this. I think if you liked omelettes then this sort of product would be ideal as you can just pour in the exact amount that you would like. 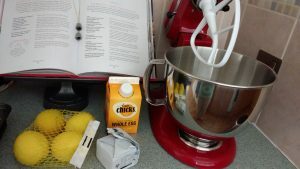 They also suggest that it is great for cooking with children, because the eggs are pasteurised, and there is no mess from cracking eggs yourself. What are your favourite egg recipes? *They were sent to me for free, but I was under no obligation to post about them. All opinions are my own.